If the visual appeal of your business’s website is your number one concern, then Squarespace is your go-to website builder. 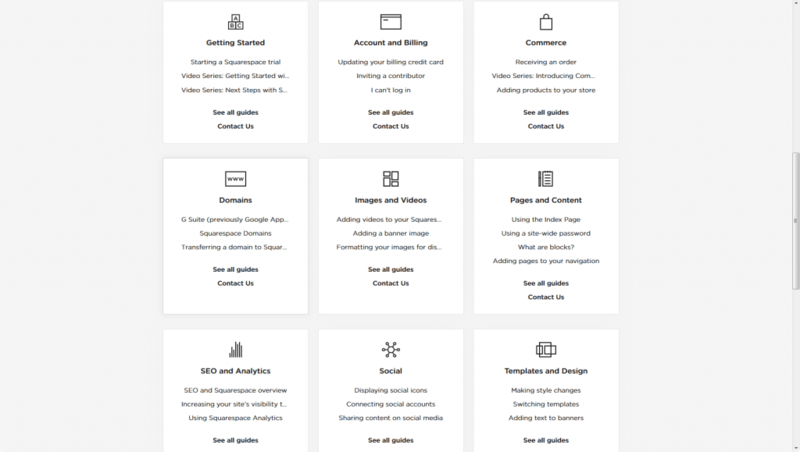 The builder is packed with meticulously designed templates and an editor not only rich in features but also offering integrations with a wide range of 3rd-party services (think Amazon, OpenTable, Bandsintown and more). And whilst you don’t need coding experience to build a professional website with Squarespace, the editor does offer the flexibility of inserting your own HTML code for further customization of your website. Squarespace’s sleek design philosophy carries over to the editor, with a clean interface and simple drag-and-drop or click-to-select design. Whilst it looks easy to use, you may actually be required to dig around to find the features you are looking for and how to edit them. But with some patience, your stunning website can go live in no-time. 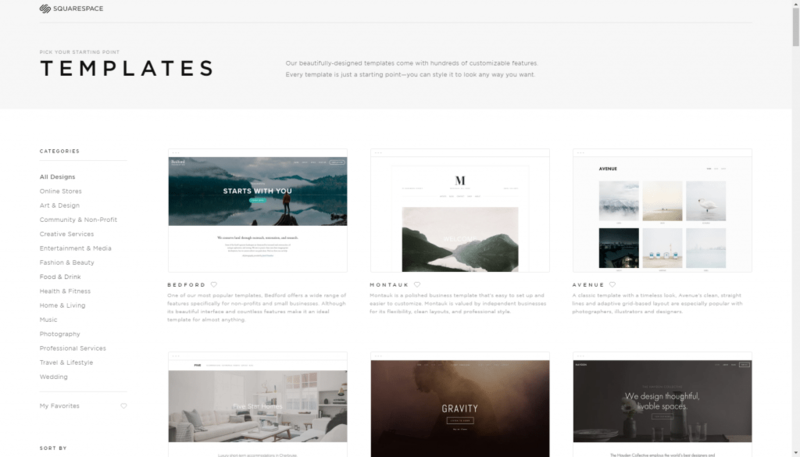 If visually stunning, sleek and modern looking templates are what you are after, then Squarespace most likely has a template for you. From minimal and spacious, to unconventional with full-screen imagery, Squarespace’s templates are certainly unique, offering the wow-factor with their professional designs. The approximately 70 templates (all of which are responsive) are grouped into 14 categories including online stores, art & design, community & non-profit, health & fitness, professional services. photography, travel & lifestyle and more. Judging by their templates, Squarespace caters to the more creative business owner. Although their templates can be customized (making them suitable for all business types), you should keep this in mind if you are looking to build a simpler, less visual website. Although no blank canvas template is available, meaning you can’t design your site from scratch on Squarespace’s platform, you can access the template’s CSS (via Design > Custom CSS) if you wish to customize the design of your website (this will of course require coding knowledge). Furthermore, Squarespace’s editor allows you to install multiple templates on your website, meaning you have the flexibility to change to a different template once you have started editing your site. Site Content: What is your website about? Site Goals: What are your goals for your website? Site Content: Who is your website for? Site Title: Enter your site title (business name). Pages: here you select the page you wish to edit. The template’s built-in pages all start in a ‘demo’ setting, which is essentially a fully edited page with textual/ visual content. You are then given the option of creating the selected page, or deleting it (the advantage of making all pages ‘demo’ and requiring you to click to create the same page-that technically exists- isn’t clear, but once you get the hang of it this is a very quick step to overcome for each page). Navigating between each page is straight-forward, however you will notice that the home page isn’t listed in the main pages menu- you need to scroll down to find it under the ‘Not Linked’ pages (as it doesn’t have a link in the menu navigation). You can also navigate between the pages by clicking the main menu and site logo (for the home page) within your site preview. As you hover over each feature on the page (such as titles, banners/images, texts and more), a small banner will pop-up that includes a button to edit just that feature specifically. When editing the content blocks element (page text), there is a nice feature allowing you to select from a range of elements to add to the page. As you hover over the content block, a horizontal pin (Squarespace calls this the ‘insert point’) will appear- click on it to open the list of content elements you can drag-and-drop into the content block (Sounds confusing, but when you start editing an internal page on your site a quick pop-up will explain what to look out for). To add more elements, just click the + at the top right of the content block. Basic: Includes title for menu navigation, page title tag and meta description, URL slug and password protection. Media: Add a banner/thumbnail image or video. Advanced: add page header code (such as Google Analytics code). Depending on the type of page you are editing, the functionality of the editor will differ. For example, when creating a new page not already in the template (by clicking the + at the top of the Pages menu) the left side menu changes to a menu of page layouts. As well as set your page title, you can select from a range of layouts, specifically designed for the core page types of any site: About, Contact, Details, Features, Images, Team and Other. Once you have selected your preferred layout, click ‘Start Editing’ and you will be taken to a full-screen view of the page, allowing you to select any and every element and customize it to your liking. You can also add additional elements by clicking the ‘Add Block’ button on the top right of the page. When creating a Gallery/Portfolio page (or ‘Artist’ page, as it is called in this template), the left-side menu will change to an editor that requests you add images. Interestingly, when you click to edit the text within the page, a pop up displays the page settings editor (as mentioned above) and in this case, the text you enter for the meta description is the text that will be displayed on your page. Additionally, a Gallery page displays the images one under the other at approximately half the page’s width (as you can see in the screenshot below)- there are no options to edit the layout, size or display options of the images within a page. Open a new page instead of a gallery and select the images layout which will allow you to select the layout of your images on the page as well as add additional elements to the page. Note that this requires uploading your images one-by-one so is not recommended for galleries with large numbers of images. On a new page, choose your desired layout and then from within an existing content block, click the + to add a new block. Scroll down the list of elements to the ‘Gallery’ section- here you will see four options for gallery layouts: slideshow, carousel, grid and stacked (displays images one of top of the other, but at full width). Once you have selected the gallery layout, you can bulk upload all of the images at once and edit the design of that layout. For example, we selected the Grid layout and could edit the aspect ratio, number of thumbnails per row (which also changes the size of the images) and set a link or lightbox popup for each image. This is definitely the most functional of all gallery options and is therefore recommended by WebCreate. Content: Here you can enter the article’s title, content, add images, video and more, add tags and categories and control commenting on the page. Options: Control the post’s thumbnail image, post URL, author, article excerpt and more. Location: Add your business details and a map to the post. Social: Integrates with your social media accounts to automatically update them when your post goes live. Images, name, description, tags and categories. Pricing and Variants, SKU number, stock levels, dimensions. Additional information such as longer description and videos. Form that shoppers will be asked to fill out when adding that product to their cart. Options such as thumbnail image, product URL, custom ‘Add to Cart’ button and set as ‘Featured Product’. Social integration to update your social media accounts when the product is added to your store. Squarespace’s Online Store editor also allows you to build a store for services and digital products. The functionality of the Online Shop editor is pretty similar no matter the type of product, with slight customizations depending on your product type. Design: here you can control site-wide design elements. Logo & Title: Set your site title and tagline, upload your logo and favicon and set a default image for social sharing of your content (shared blog articles will use their thumbnail images). If you don’t have a custom logo, Squarespace offers a really nice logo creator where you can browse (and search) through their library of thousands of icons to create your own unique logo. Template: Switch to a different template. Style Editor: Manage text colors, sizes and fonts (hundreds of free fonts from Adobe Typekit and Google Fonts). Checkout Page Style Editor: Edit the colors, text and buttons of your online shop’s checkout page. Lock Screen: Customize the page site visitors will see when they land on password protected page. Announcement Bar: Create a custom announcement bar with a feature message that sits across the top of your website. Mobile Information Bar: Create an information bar that sits at the bottom of your mobile site with easy-to-access business information such as your phone number, business hours and address. Squarespace Badge: Enable/Disable a “Powered by Squarespace” badge for your website. Custom CSS: Insert CSS code to customize your website’s design. Note: Squarespace warns that adding custom CSS can damage the design on your site and their support team will be less likely to help with design related issues, so implementing code should be left to a professional. Advanced: Enter your Typekit kit ID to enable custom fonts, disable mobile-optimized designs on your template so that your website displays the same on desktop and mobile (usually this is not recommended). Squarespace’s logo creator: High resolution logos are free for Squarespace customers, otherwise $10. Low resolution logos can be saved for free but include a watermark. Commerce: day-to-day management of your online store. Orders: Check the status of current orders, search your order history and export orders to CSV. Inventory: Manage inventory across your entire store. Customers: View your full list of customers and discover key insights about their purchase behavior. Discounts: Create discounts that can be used at checkout. TIP: There is also a Squarespace Commerce app for iOS and Android so you can manage your online shop on the go! 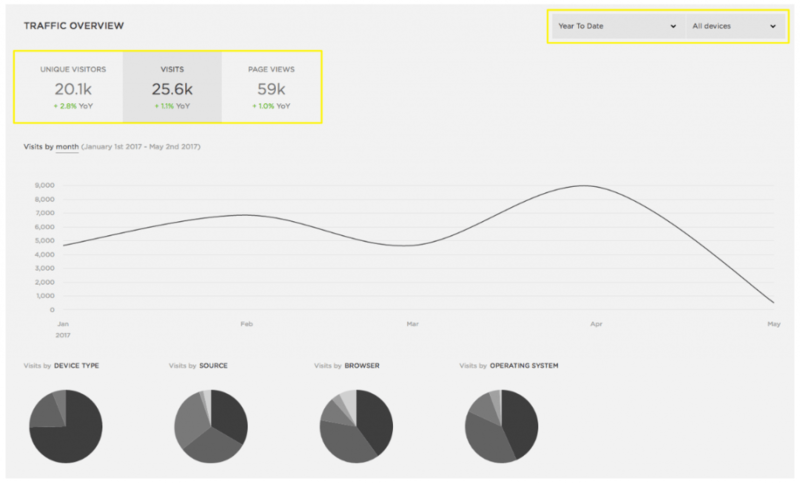 Analytics: View basic data about your website’s traffic. Traffic Overview: Unique visitors, visits, page views. Traffic Sources: See where your visitors are arriving at your site from (requires commerce plan). Popular Content, Site Search Queries, RSS Subscribers, Search Engine Queries and more. Websites with Online Stores will also have access to revenue, conversion and cart abandonment data. TIP: Whilst having access to such analytics data within the platform is handy, we would still recommend using Google Analytics to track your site visitors. Squarespace does provide built in integration for the free tool and google analytics provides a much more comprehensive analysis of site traffic. Settings: Control your general account settings, website settings and commerce settings. The General Settings include entering your business details (many of which will be used by your template), setting your timezone, adding site contributors and authors and managing your billing information for your Squarespace plan. In the Website Settings, you can connect a domain, access G Suite email, connect social media accounts and set up sharing buttons, set basic SEO settings (covered in more detail below), implement Disqus’s commenting system for your blog, activate Accelerate Mobile Pages (AMP) for blog posts and more. Activate payment options such as Stripe and Paypal. Customize checkout options such as default shipping address, abandoned checkout emails and insert a ‘Subscribe to our Email List’ link which integrates with a MailChimp account. Manage automated emails customers receive upon placing an order as well as the notifications you receive for each purchase. Determine shipping options and taxes. US users can connect their Squarespace account with Xero to manage the financial accounting of their online store. Create customized messages if accepting donations through your site. Help: opens a new tab and takes you to the Squarespace Help hub. The help center offers guides, videos and articles as well as webinars (broadcast from New York City). Users who live in New York can also attend workshops to learn the basics of using Squarespace’s website builder. All of Squarespace’s templates are designed with mobile users in mind, offering responsive designs as well as built-in mobile optimized styles that are activated when your site is viewed from a mobile device. We have to admit, finding how to view the mobile and tablet friendly versions of your site within the editor was a frustrating challenge (we had to search the help center for that one!). It would be beneficial if Squarespace would add an icon or button, indicating that the small horizontal line that sits at the top of the editor above the page you are editing, actually opens a small menu where you can select which device type you wish to view your site on (mobile, tablet or desktop). Squarespace is one of few website builders that offers a preview of your site on tablet as well as mobile devices. Browsing through your website’s pages on both mobile and tablet, you will see that every page, element and even manually-added layouts fit neatly within the screen. Squarespace have obviously gone to great lengths to optimize every aspect of their templates for mobile, which explains why they don’t give access to edit the mobile version of your site (although it would be handy to have this option in case there was an element you preferred to hide on mobile devices). Although we don’t recommend this, there is an option available for users who wish to present a non-mobile optimized version of their site. This option can be found in the editor under Design > Advanced > Disable Mobile Styles. Note that the responsiveness of your site can not be disabled. Knowledge Base: In-depth guides covering a range of topics from ‘getting started’, ‘account and billing’ and ‘templates and design’ to ‘SEO and analytics’, ‘integrations and customizations’, ‘technical issues’ and more. Each comprehensive guide also include useful videos. Videos: A library of video tutorials full of tips on how to get the most out of the website builder. The video’s are super-easy to follow and many will find the visual guides a lot easier to understand than those found in the Knowledge Base. Community Answers: A forum-based support center where users of Squarespace help each other solve a range of problems. Squarespace users in New York City have the added benefit of attending group workshops, 90-minute sessions that incorporate presentations as well as practical group work to help users build their confidence with the platform. And for those that can’t make it in-person, online webinars are also run several times a month, covering a range of topics from beginners to more advanced lessons (broadcast from NYC). If you can’t find the solutions you need from their online support, you will find a ‘Contact Us’ button at the bottom of every page which leads you to a short questionnaire. Once you have selected the topics that best relate to your issues, you will be given the option to email Squarespace (response time during business hours is usually one hour) or begin a live online chat session (available Monday to Friday, 3am-8pm Eastern Time). There is no contact number to call Squarespace and no additional support for premium packages. One thing we did like in terms of Squarespace’s support, was that after signing up for an account, we received a welcome email as well as a ‘Getting Started’ support email, full of tips and tricks. This is great for new users who aren’t really sure how to get started building their site- Squarespace lays out the first steps for you with a short tutorial video and links to more detailed information. Fostering the connection between opening an account and actually leading you to build your site is something very few website builders do. Squarespace does not offer an app market like their leading competitors Wix and Weebly. However, you will find that a lot of the features offered by app markets on other builders are built-in on Squarespace. Take for example Squarespace’s Form element. The basic form includes four fields: name, email address, subject and message. But you can customize the form with a further 20 field options such as surveys, website links and date and time settings. Form submissions can be sent to your email address, a Google spreadsheet or even a MailChimp list. This functionality is available on Wix and Weebly by adding free or paid apps from their app markets. Additionally, Squarespace offers direct integration with a number of third-party companies (eg. Acuity Block for online bookings) meaning you can easily embed their widgets on your Squarespace site- and receive Squarespace support for these integrations. Integration with other third party apps/widgets is possible if they offer an embed code, which you can add to your site using the code block element. It may seem as though the SEO options offered within the Squarespace editor are somewhat limited compared to other website builders. For one, the builder doesn’t ‘push’ SEO the way Wix does, with its SEO Wizard and SEO settings on every page. But when you enter the SEO settings (found under ‘Website’ in the main Settings), you will realize that Squarespace has actually invested in streamlining part of the SEO process for you. to automatically create each page’s title tag (giving you the title tags we listed above). This is a big time saver and a great SEO feature from Squarespace! Meta descriptions still need to be entered per-page (in the page settings, as shown in the ‘Editor’ section above) along with page title, navigation title (menu display name) and unique URL slug (these SEO functions are standard across all builders). Sitemap: A sitemap.xml is automatically generated and linked to your site. SSL Certificates: Squarespace offers free SSL certificates for all domains. Clean HTML Markup: Squarespace’s templates handle the HTML code for you. For example, you don’t need to add the <h1> tag to a page’s main heading, just select the heading style in the editor and the tags are automatically created. Image Tags: Image descriptions are converted to <alt> tags. 301 and 302 Redirects of old pages: Can be implemented in Settings > Advanced > URL Mappings. Squarespace also offers easy integration with Google Search Console. The integration lets you identify keywords that bring traffic to your small business website and to make optimizations accordingly. When you open an account with Squarespace your site will sit on a built-in domain- Squarespace’s custom URL for your site: myaccountid.Squarespace.com. 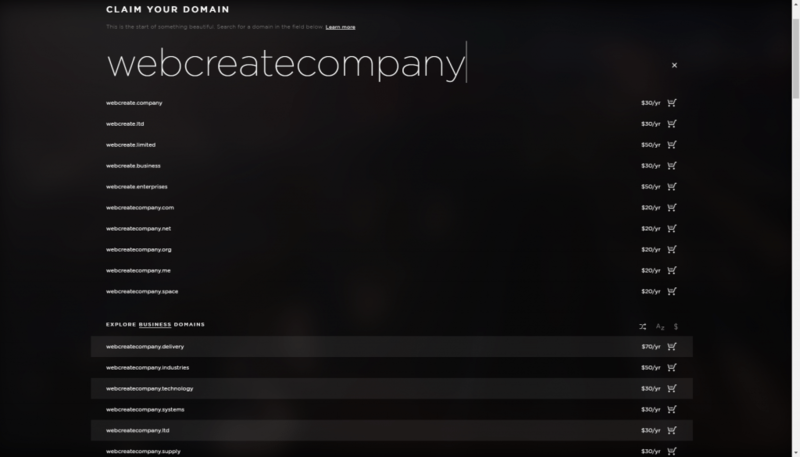 This built-in domain will be replaced by the custom domain you connect to the site when it goes live. This can be done from the account dashboard, by clicking ‘Domains’ on the toggle bar at the top of the page or from Settings > Domains. You will be taken to a page where you can search for and purchase your desired domain name or connect your pre-purchased domain to Squarespace. If you wish to purchase a domain name through Squarespace, run a search for your business name (or preferred domain name) and you will be provided with a list of available domain names and their prices. You can see in the screenshot below, .com/.net/.org/.online and additional domain extensions cost $20/year whilst more unique domain extensions such as .industries/.technology/.delivery can cost up to $70/year through Squarespace. Domains purchased through Squarespace are hosted by their domain provider and host, Tucows. Keep in mind that plans purchased on a full year subscription receive a domain for free for the first year. Transfer the domain to Squarespace to manage all of your domain settings within your Squarespace account. The transfer can take between 1-15 days and costs between $20-$70, depending on the domain extension. In order to complete the transfer you will need to purchase domain registration for one year (free for most users for the first year) which is added on top of your pre-existing domain registration. If you wish to keep your domain registered with the 3rd-party provider (such as GoDaddy, BlueHost etc. ), you can connect the domain to your Squarespace site by changing the settings in the provider’s account. The changes are implemented through the provider’s default nameservers and the domain registrar must offer full DNS access for the connection to be created. It is worth noting that when you domain is transferred and registered with Squarespace, they can offer full support for domain related issues. 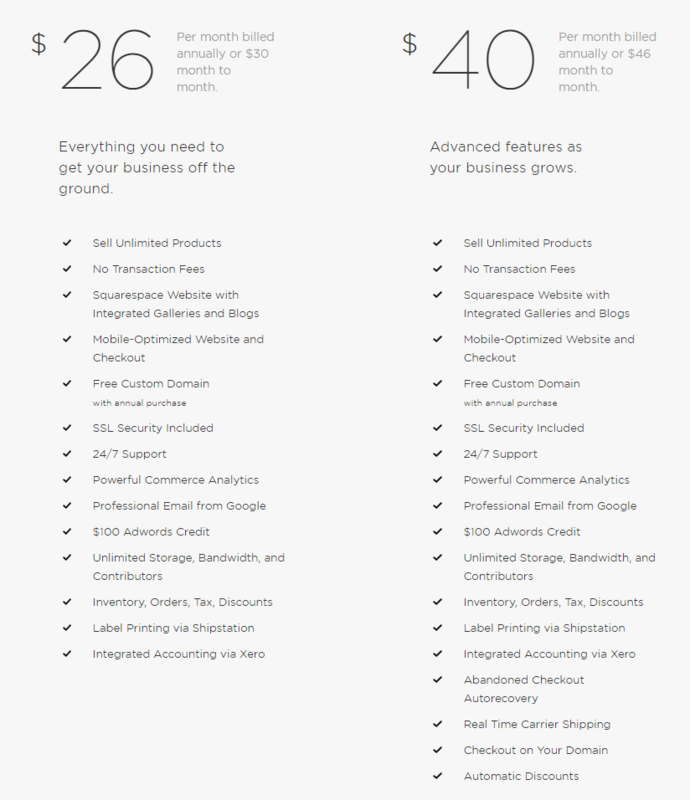 All Squarespace plans include free hosting with unlimited storage and bandwidth. Squarespace also offers import and export capabilities for your site. You can import post content, comments and images from Blogger, Tumblr and WordPress. eCommerce stores can also import products from Big Cartel Etsy and Shopify. If you wish to move to another platform, you can export your content from Squarespace via a .xml file. 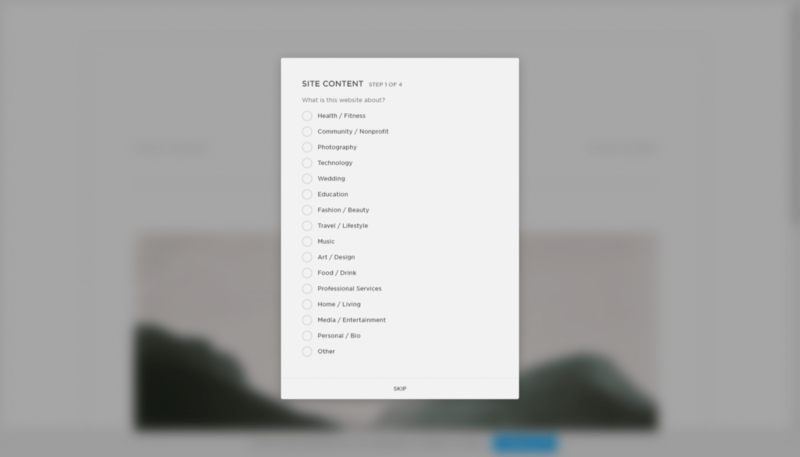 Squarespace offers all users a 2-week free trial to build a new site, test the builder’s features and decide if their platform is right for your business needs. If two weeks isn’t enough, you can extend the trial by 7 days. In order for your site to go live, you will need to upgrade to a paid plan (there are no free plans at this stage). To upgrade your site, you can select from one of four Squarespace premium plans– personal, business or one of two eCommerce plans. WebCreate readers can get 10% off their first Squarespace subscription with the code WEBCREATE. 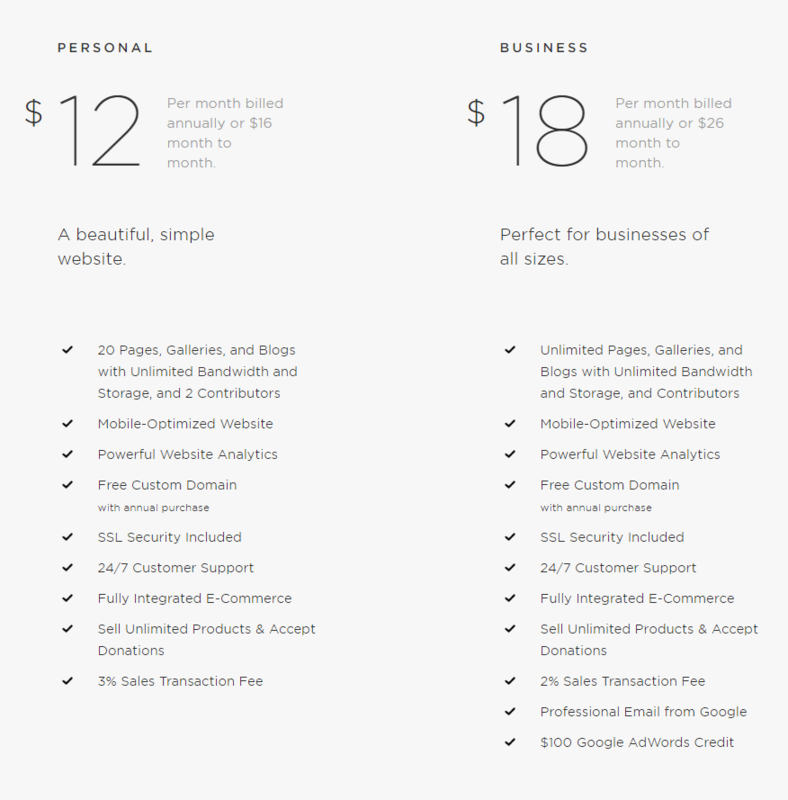 For a complete breakdown of Squarespace costs, read our Squarespace pricing review. The Basic eCommerce plan starts at $26/month on an annual subscription and includes a free custom domain, no transaction fees, 24/7 support, inventory management, integrated accounting and more. The Advanced eCommerce plan- at $40/month on an annual subscription- includes all of the above plus abandoned checkout autorecovery, real time carrier shipping, checkout on your domain and automatic discounts. If you plan on selling large quantities of products/services on your site, we recommend selecting an eCommerce plan as the personal and business plans include a transaction fee for every sale. Special offer for WebCreate visitors: Get 10% off your first Squarespace website. Use coupon code: WEBCREATE. Visit Squarespace to open your account. Unlike its competitors, Squarespace does not offer an app market from which you can purchase apps/widgets to add to your site (eg. Advanced form builder) as most of these elements and functionalities are built into the builder. Therefore, it should be kept in mind that with a wide range of integrations available, most customizations to your site can be implemented without additional monthly costs. After 14 years in the business and millions of sites created, Squarespace is constantly improving its platform, offering the latest features, customizable elements and sleek, professional templates for users who want to create modern, functional and powerful websites. Switching your website’s template- you can work on multiple templates for the one website. Exporting your sites’ content and transferring it to another website-building platform (export is performed via a .xml file). Editing the code to customize the elements and content on your website (via Settings >Advanced >Developer Mode). Offering one of the best ‘final products’ of all the website builders, use Squarespace to build your business a stunning, modern and visually appealing website. The professional-looking templates, range of integrations and eCommerce capabilities of Squarespace make it a top choice to build any type of website. But be prepared to invest time searching for all of the editor’s features, editing them and perfecting the elements on your site. Code access to further customize your website. A wide range of 3rd-party integrations is included with premium plans at no extra cost. No mobile editor – you can not edit the mobile view of your website independently of the desktop view. Editor navigation is trickier than other website builders, with many customization options hidden behind several menu options. No free plan (Free 14-day trial only). Have Experience With Squarespace? Share it!